Great sides can make or break a cookout. They can also make or break your bill of health, given the omnipresence of mayo, salt, meat, butter, and other goodness. But you don’t have to go full Fieri on the sides to make them great. Take a cue from the below healthy recipes and you’ll be able to own a cookout without tipping the scales. Grilled veggies are great and all, but let’s be real: the bottom of many a grill is littered with the charred corpses of zucchini, mushrooms, sliced peppers, and onions that fell through the grates. These skewers fix that problem, plus offer up a flashy way to present a vegetable medley that puts the sides front and center. A Spicy Perspective has a recipe to make it super simple right here. Bean salads are a great way to make people think you worked harder on your side than you really did, but this version elevates what is often an afterthought with a blast of Middle Eastern flavors. Ambitious Kitchen has the, um, ambitious recipe here. For a sweeter side, grilled fruits are an underutilized option, and these skewered peaches and cherries are as eye popping as they are delicious, even before they’re hit with a layered cinnamon-honey syrup. Sure, they taste better with ice cream, as intended, but you can skip it if you’re feeling health-conscious/crazy. Home Cooking Memories has the secret to the skewers right here. 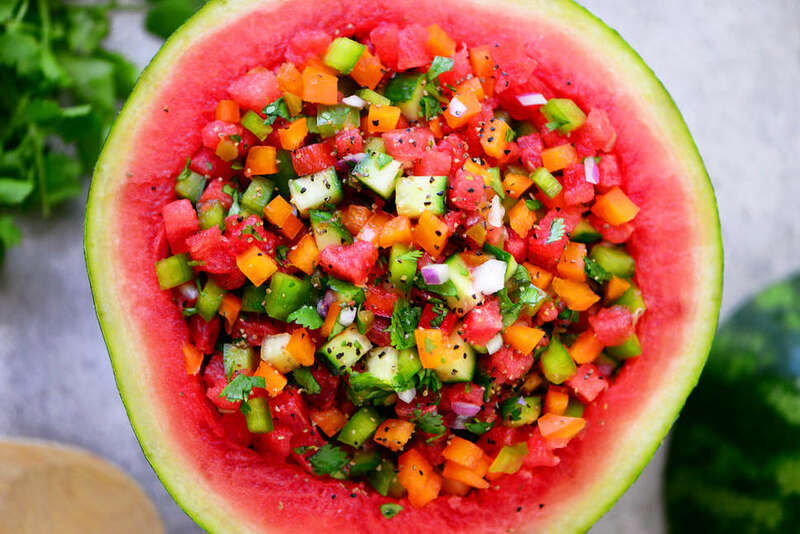 Watermelon is a sneaker candidate for the best BBQ sides, and hollowing out a half melon and filling it with more fruit, spices, peppers, and lime can be a showstopper. It’s sweet. It’s spicy. And it’s damn refreshing. Get the entire recipe at The Gunny Sack. Oftentimes, attempting to transform a deep-fried bar snack into something healthy backfired spectacularly. But this reinterpretation of the jalapeño popper pulls it off thanks to a little crunchy bacon and a whole lot of grilled corn. Pop over to Wonky Wonderful to learn how to do it. The concept of a healthy deviled egg seems like a recipe for an instant whiff, given the creamy whipped egg yolks are the star. But add some spicy avocado in their stead and you go from basic to “holy crap” in the blink of an eye. Plus, the green all but ensures they’ll stand out in a sea of otherwise ho-hum sides. The devil’s in the details of Chef de Home’s full recipe. Coleslaw is a silent killer, a side that seems healthy because it’s green, but actually packs more mayonnaise than a family reunion at Doug’s girlfriend’s (shout out to Skeeter Valentine!). This ingenious spin halves the mayo with a little yogurt, then tosses in refreshing fruits and nuts. But the real coup here is the addition of shredded Brussels sprouts, which replace the cabbage. Head over to Savoring the Good for the complete rundown.